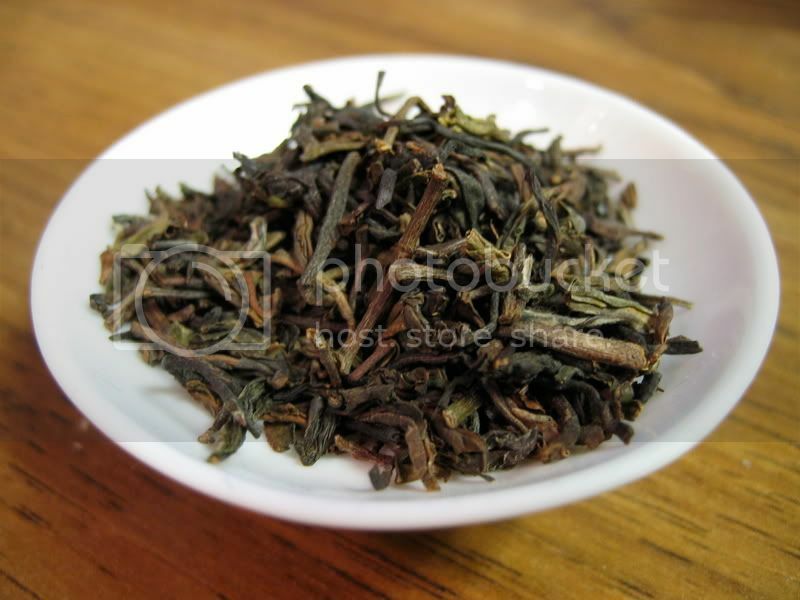 This review is of the Moondakotee Estate FTGFOP1 Second Flush (DJ-154) Darjeeling. I seem to remember liking this tea quite a bit, but apparently I confused it with another one. While not bad overall, there are a couple things that really turned me off to this tea. The dry leaves are quite average. They are lighter in color than some others, but there does not seem to be much variety in terms of whites and greens-- it's almost all light brown. Still, there are some nice, long, wiry leaves in there, so it wasn't all bad. 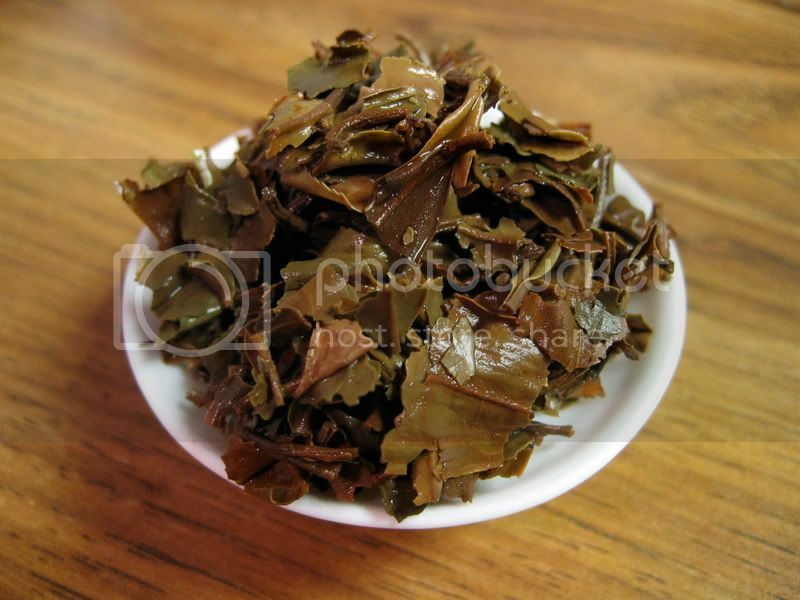 The dry leaf aroma was also a bit flat. It had a similar smell to the Tindharia Second Flush that I reviewed earlier today, though it is slightly more complex and has a subtle hint of citrus. The infusion was also so-so. It has a bit of complexity to it (which basically means I'm not good enough at tasting to describe all of it) and a subtle but fairly clear muscatel note. Unfortunately, there is a strong, tight bitterness right at the tip of my tongue which makes it difficult to taste much else. This is really what knocked this tea down from the 7-8 range to a 6. I really dislike strong bitterness (hence my short infusion times-- 2:30 for Darjeelings), so I probably won't end up ordering this tea again. Still, some people like this attribute, so I couldn't knock it all the way down to a 4 or 5. So that I avoid being totally negative, I should point out that this tea is pleasantly brisk and refreshing when iced. The Moondakotee Estate FTGFOP1 Second Flush is not a bad tea for its price, but the dominating bitterness makes it difficult to enjoy the subtler qualities of this tea. For these reasons, it gets a 6. I brewed this tea one more time to test a hypothesis that came to me after finishing this review. Generally, I find that bitterness is less obvious and sweetness is more obvious when tea is hot, and vice versa when lukewarm or cold. So, at significant personal risk (If you're the woman who spilled McDonald's hot coffee in her lap, stop reading now), I decided to test this hypothesis by tasting immediately after brewing finished, while it was still hot. Eureka! I was right! The intense bitterness can be overcome by enjoying at near-surface-of-the-sun temperatures, and if your tastebuds survive the first sip you will find that you are drinking quite a pleasant tea. Still, I don't feel lucky enough to do this every time I drink tea, so this tea remains a 6. Hot damn! You were productive these last couple days! I'll read much more closely tomorrow morning--promise! Anyway, if you remember liking this more in the past, your store might have gotten a bit old. I've had a couple ceylons and DJs that--instead of getting musty or 'off'--got very bitter with a little age. (Of course, you've probably gotten better too). Have you tried brewing this more like a green? I had a bitter DJ that I brewed more like a gyokuro and it seemed to save the sample. Hmm, that's an interesting thought. Unfortunately I'm all out of this one now, and even if it does brew up better at lower temps I'm guessing I won't like it enough to justify getting more. Still, it's a good idea. Next time I come across a bitter Darjeeling, I'll lower the temperature and try again. Thanks for the tip! I also find excessive astringency a complete turn off, but a modest amount is great, even necessary! Picky picky! As a result, I have also resorted to short brewing times -- for 1st flush sometimes down to 1 minute, for second flush sometimes down to 2 minutes. In addition, however, I have also found cooler water temperatures to be extremely helpful. In some cases I've gone as low as 167 F, although 180 F to 190 F is usually as cool as I need to go. 180 is about when the steam first starts to rise. AWHH! Expermentation is always fun. Especially when you find somethank makes it work. And you were going to give it up! Glad you didn't. Nice post! Loved how you described the temp. FUNNY! Thanks for the post because i was just about to try this tea. I have read pretty much the same results from other tea review sites. I recently purchased 100 grams of Spring Flush Moodakotee SFTGFOP1 and although there is some bitterness, I would say it is mild and does not overwhelm the taste of the tea. It adds depth to the taste. I usually steep this tea at 190F for 2 minutes and 20 seconds.